Rent Benefield House | Corporate Events | Wedding Locations, Event Spaces and Party Venues. The inside is beautifully appointed with Victorian era decor and offers many places for your ceremony. We also have large open grounds that offer plenty of space for your special day and can accommodate tables and chairs, or even seating for your ceremony. The Benefield House Bed and Breakfast is located in historic Jefferson, Texas and is a Queen Anne Victorian painted lady. The house was built in circa 1895 and is a Recorded Texas Historic Landmark, but has the amenities of today. 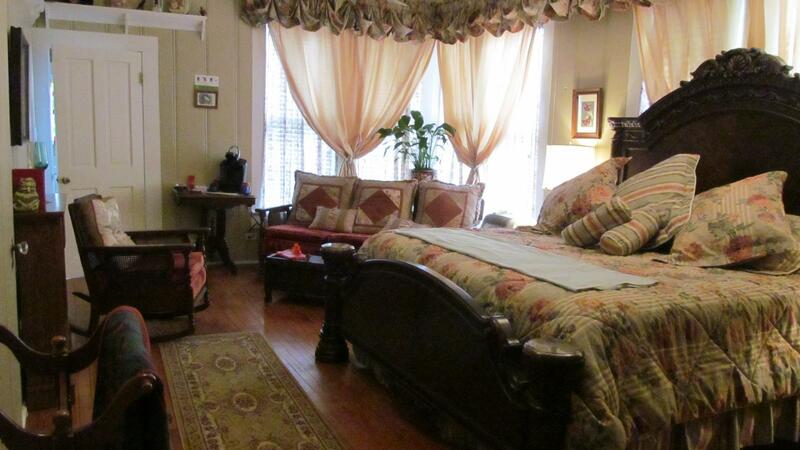 Our Jefferson, Texas bed and breakfast is ideally suited for a weekend getaway or a romantic interlude. It a perfect place to host an intimate wedding, vow renewal or any special event. Our Inns three guest rooms are luxuriously, yet comfortably appointed with all Kings size beds each with private baths with both tubs and showers in room Coffee stations, bathrobes and more. Guests may also enjoy the comforts of our two parlors and all day refreshment bar. There are spacious, well manicured grounds for strolling or just sit on the porch and enjoy the calm. The picturesque town of Jefferson, in northeast Texas, features attractive old Southern homes, as well as Victorian style homes, cozy antique and gift shops, museums, and many fine restaurants and Bistro’s. There are boat tours in town or on the Big Cypress Bayou and Caddo Lake, Historic horse and carriage rides, steam train rides, and tours of historic homes. Enjoy nature trails, hiking, a local winery, beaches, and other recreational areas in nearby Caddo Lake National Park. See the Historic Turning Basin and riverfront walk. The Benefield House Bed & Breakfast is located in walking distance to the town center. Jefferson, Texas is known for its Southern hospitality and innkeepers Donna and Frank hold true to that tradition at the Benefield House Bed & Breakfast. Your special event can be inside or outside for up to 20 guests. At the Benefield House, we offer an elegant, all-inclusive packages for you Historic Jefferson, Texas wedding, anniversary, bridal shower, baby shower or any special occasion. This is a very exciting time so, to make your day even more enjoyable and less stressful we have made an all-inclusive package or we can tailor one just for you. So let us know your plans and we will do our best to make them happen just as you imagined.